We are pleased to introduce a new feature: thanks to a partnership with Wild Apricot, now you can join/renew NEHA membership online, or sign up online for conferences using our new membership and registration portal! Check it out – Spring 17 registration is now open! Sign up or renew your membership online. Register by: March 26, 2019. The Gilder Lehrman Center for the Study of Slavery, Abolition and Resistance announces its 8th Annual Yale Public History Institute for June 9-14. The Institute seeks people currently employed by cultural institutions as staff or as freelance consultants. Participants should have at least three years of professional experience beyond their last academic degree. Historic New England seeks applicants for its weeklong intensive summer Program in New England Studies, June 17-22. Learn about New England culture from the seventeenth century to the Colonial Revival through artifacts and architecture. The Program is designed for mid-career museum professionals and graduate students in the fields of architecture, decorative arts, material culture, museum studies, or public history. Candidates from diverse cultural backgrounds are encouraged to apply. Application Deadline: April 21, 2019. The New England Journal of History seeks articles and book reviews for upcoming issues; it is published twice yearly with submission deadlines January 15 and July 15. 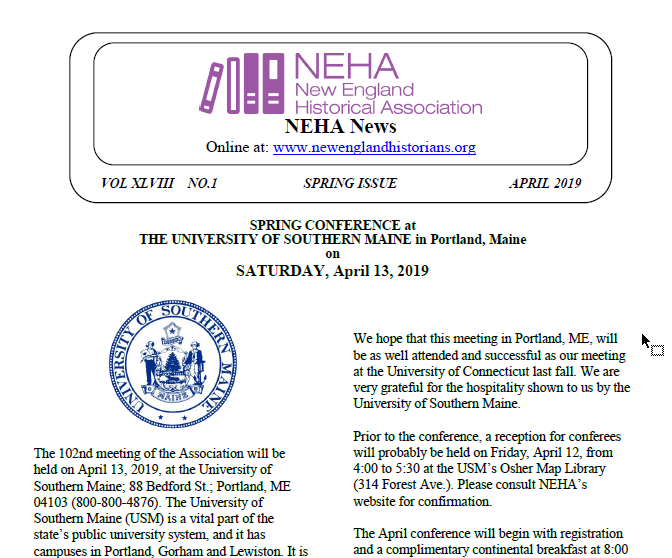 Please send submissions or inquiries to editor Linda Morse, editors@nejh.org. The History Press is looking for local historians and writers who are interested in publishing accessible histories of the towns and communities of New England. The History Press is a traditional, full-service press that focuses exclusively on publishing works of local and regional interest. They publish a wide range of books from brief histories of a town to collections of folklore and essays on the local culture. A typical author has strong ties to their community, and they strive to make their local history more accessible. For more information, contact Edward Mack (commissioning editor). All Things New England is looking to expand its site. They are looking for interesting stories from knowledgeable individuals pertaining to New England landmarks and historical places, length 800-1200 words.